Detail from the cover of Justice League #5. For the last few years, Lex Luthor has been parading around in power armor with Superman’s S-shield on it, acting as an imperious good guy. But this summer, he’s going back to being a big bad in a big way by creating an all-new team made up of the DC’s elite archvillains—meaning the Legion of Doom is finally coming to the New 52 universe. Months ago, DC Comics announced a sweeping makeover for the Justice League that sees different super-teams working under the Justice League banner on missions with a bigger, more cosmic scale. It begins next week when Justice League relaunches with a new #1 issue, helmed by Scott Snyder alongside artists Mark Morales and Jim Cheung, who will eventually be joined by Jorge Jiminez. Additionally, James Tynion IV (who also will be writing his own Justice League book, Justice League Dark, with Raúl Fernández and Alvaro Martinez on art) will guest-write a series of spotlight issues in the main Justice League comic, examining how the DC Universe’s supervillains respond to all the cosmic changes. 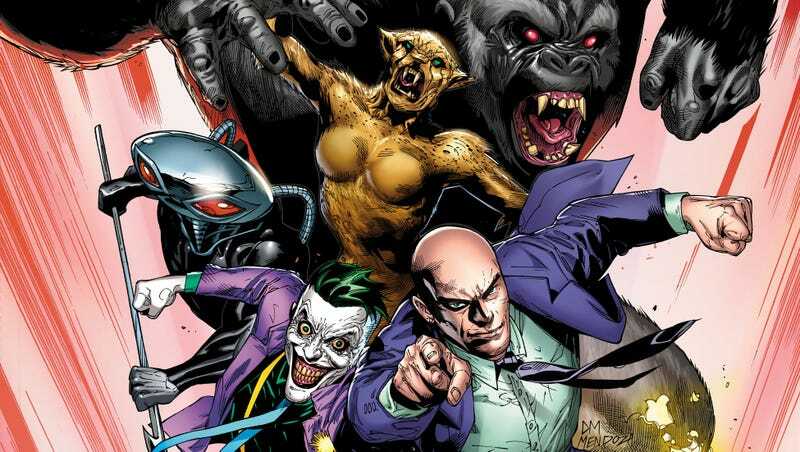 The first of these villain spotlight issues will be August’s Justice League #5, with art by Doug Mahnke and Jaime Mendoza, which is also when the Legion of Doom will make its debut. I spoke with Tynion on the phone two weeks ago and the prolific writer talked about how he’s bringing the Legion back, and the dangerous new energies coming into play in the DC universe in the aftermath of Dark Metal. The full cover for Justice League #5.
io9: You guys are calling this amalgamation of supervillains “The Legion of Doom.” What makes the Legion of Doom different from, say, the Secret Society of Supervillains or the Injustice League? James Tynion IV: There are sort of two answers to this. On one front, it’s about the core dichotomy in the series itself. We’re going to be seeing a story that touches on the meaning of justice and also on the meaning of doom. Doom comes from a word that means, essentially, “fate.” It didn’t necessarily used to have negative connotations, but it still has the weight and that was something that we really wanted to tap into. We wanted a name that carried the same sort of weight as “The Justice League,” so that’s really where it came from. Honestly, the other reason to do it is because the Legion of Doom has such weight in [pop] culture, even just going back to the Superfriends cartoons. It’s not a term that we’ve really seen used in the comics. Maybe here or there, for smaller things, but never to really encapsulate what the Legion of Doom meant in the original Superfriends cartoon. We’re working on something big and revelatory and wanted Justice vs. Doom for the weight of those two big concepts smashing into each other. And we’ve been talking about it since the planning stages of [Dark Knight:] Metal, where there’s something that nods to the Legion of Doom headquarters. It’s something we’ve been building to for a while. What’s behind the decision to spend entire Justice League issues spotlighting villains? Tynion IV: I work very closely with Scott Snyder, and now that I’m in New York City, I drive out to Long Island for a work day every single week. And we talk about what I’m doing in Justice League Dark, what he’s doing in the main Justice League book, and we’re building this larger mythology about how everything sort of ties together. We’d talk about various moments with the villains [that] we kind of realized there wasn’t room for in the main title. So, we decided to create these touchstone issues where we show the story from the villain’s perspective. And so, these issues are going to kind of intersperse the core Justice League run, and we have a lot of amazing artists lined up. Where does the path to Lex creating the Legion of Doom start? Tynion IV: In the first arc of Justice League, the two villains whose mythology we’re kind of blowing up are Sinestro and Grodd. There’s something called the Invisible Emotional Spectrum that we’re going to see activated in the main series, and there’s the Still Force. And Scott’s sort of hinted at these things elsewhere, but those are the two core drivers of the first Justice League arc. So, in this issue, we take a step back and it flashes back to the moment where Luthor makes the pitch [to them], of just like, “You, Sinestro. You, Grodd. You’ve been thinking far too small... You’ve been going half-step.” And it’s Sinestro at the edge of the universe. It’s Grodd taking over the UN. It’s Luthor telling them, “You aren’t thinking big enough.” And these are the biggest villains in the DCU. So we wanted to sort of capture those moments where we see Luthor making the full-hearted pitch for the Legion of Doom. The Still Force, the Invisible Emotional Spectrum, and these fundamental forces of the universe being reordered are consequences of the Source Wall breaking in Dark Metal, right? When does Luthor find this stuff out? Tynion IV: When Luthor walks into the pages of Justice League #1, he has uncovered an incredible secret about our universe. And that secret is the thing that drives his actions through that first issue, and the entire first arc of Justice League. That’s really where it starts. And the mystery of what he wants is something that’s going to play out over the course of the run. So. that is a very, very good question and I cannot answer it in full. Fair enough. So who’s on the roster? Tynion IV: Luthor, Joker, Manta, Cheetah, Grodd, and Sinestro. That is the core roster. How do these villain spotlights play out structurally in the overall Justice League story? Tynion IV: We’re going to see Justice League arcs that are playing out and these stories are in conversation with those arcs. Like, the first arc is big on Grodd and Sinestro, so we feed those conversations in issue five. In the next spotlight issue, which sets the stage for the second arc of Justice League, we’ll see the pitches made to Black Manta and Cheetah, and then we’ll see the one I am most excited to write—in the third Legion of Doom[-focused] issue, we’ll read the pitch Luthor made to Joker. And there are other villains that are in the periphery who I can’t even start hinting at. But within these first Legion of Doom spotlight issues, we wanted to sort of establish what each of the villains are trying to get out of joining the Legion. And you know, Luthor chose these people for very specific reasons, and it’s because of the mythology that he can tap into through the villains. It’s no mistake that the villains kinda match up to some of the core heroes of the Justice League. An Omega Titan makes his presence felt in No Justice #1. So this is a programmatic decision on Luthor’s part. Before these characters teamed up it seemed like, “Hey, we have this one common goal...” Here, it’s more like a strategic partnership. You’ve been pretty well traveled all over the DC Universe at this point, but the vast majority of the your tenure has been in the Bat-books. What’s it like writing Lex and Grodd and Sinestro and the others? Tynion IV: Luthor is probably my favorite villain in all of comics. Lex Luthor is, I think, the double of Superman. If Superman represents the best of us, Luthor represents the worst of us while also representing, kind of, the best of us. He’s the perfect, twisted version of Superman. He’s a kind of Lucifer figure for the DC Universe, someone filled with so much prideful rage. Basically, this whole story starts with Luthor being made to feel small, and Luthor… refuses. Luthor being told that he has to be this small thing in the face of the universe is not something that he’ll ever accept. And a character who has that kind of fierceness of will and total confidance is intoxicating and really fun to write. Tonally, what we’re trying to do with Justice League and everything is we’re playing with the full sandbox of the DC Universe, and the Luthor we’re tapping into here isn’t just the suit-and-tie businessman. We’ll see him in his iconic costumes in the series, but this is the mad scientist Luthor more. In the Legion of Doom, we see him, like, in a suit and tie walking along the Source Wall. Like, this is Luthor Proud. Lex and a bunch of no-so-good guys working with the Justice League in No Justice #1. One thing that was very important to Scott from the beginning is that with these Legion of Doom characters—they are very arch villains. They embody villainy in this huge way. But Luthor’s making a pitch to them, a pitch that’s compelling—even to a good person. When the universe tells you what your limitations are, you don’t have to pretend you’re better than you are. You can be exactly what you are to the fullest extent. And you can embrace that selfishness and find power, and save yourself in the face of the universe. We want people to read these issues and say, “You know what? I’d actually side with the Legion of Doom over the Justice League.” So, if we do our job, that’s what we’ll do. It sounds like Lex and the villains will be finding renewed purpose, just like the heroes. Tynion IV: These issues provide a different perspective. In the core arcs, we’re going to see what the heroes are going through and why they’re making the decisions they’re making. The book is Justice League. We’re following Team Justice, all the way. [But these are] an opportunity to take a pause in the middle of the story and see... what the villains have been up to, and the vastness of the story. The villains know more than the heroes at one point of the story, and at others the heroes know more than the villains... it allows us to come at the greater cosmic mystery that we’re building over the Justice League series from two perspectives. And every arc of Justice League, and every Legion of Doom[-focused] issue in the context of it, will shine a light at different corners of the mythology taking shape in the DC Universe. The Justice League comic relaunches next week on June 6—and the new Legion of Doom will make its debut in Justice League #5, on shelves August 1.